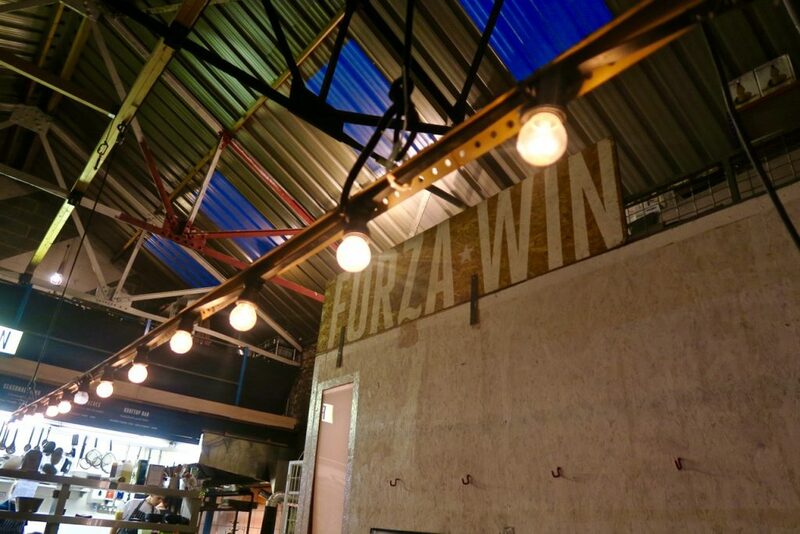 Forza Win is a popup that has made its way around the city gaining in popularity until, eventually settling in Peckham, South East London. I am shockingly bad at leaving East London but spurred on by that fact it was my friend Lucy’s 30th birthday I hopped on the Overground and took the surprisingly short trip South. The second I stepped off the train I was enamoured with the area, it was bustling and filled with art. Stepping through the alleyway to The Bussey Building there were many independent bars and restaurants, as well as a food market. 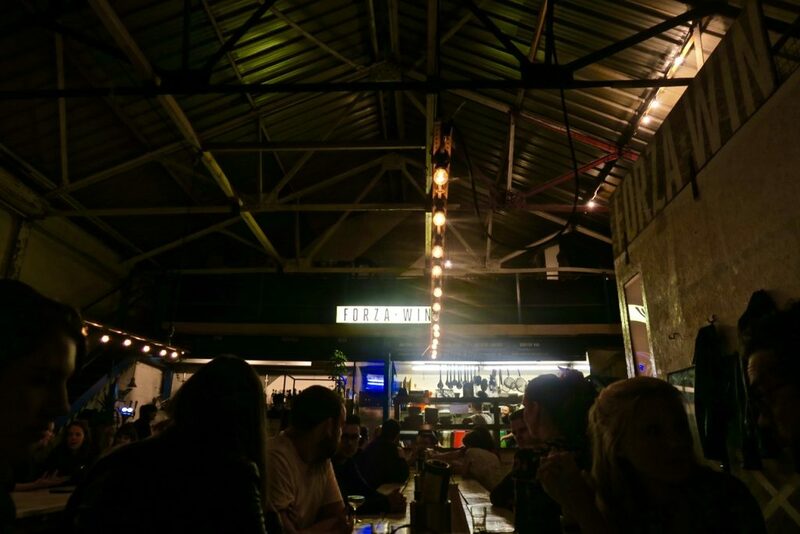 The industrial environment, street art and lively vibe reminded me of a mix between Berlin, Brooklyn and Hackney Wick – some of my favourite places to hang out. Making our way to the back of the estate we easily found Forza and, after being welcomed by the friendly host, made our way to the large communal tables. Suddenly our friends all arrived at once, niceties and introductions out of the way it was time to get down to the serious business of eating! The menu is set and paid for in advance but I had completely forgotten what was on offer so was grateful for the introduction to Forza Win from Casper one of our hosts for the evening. 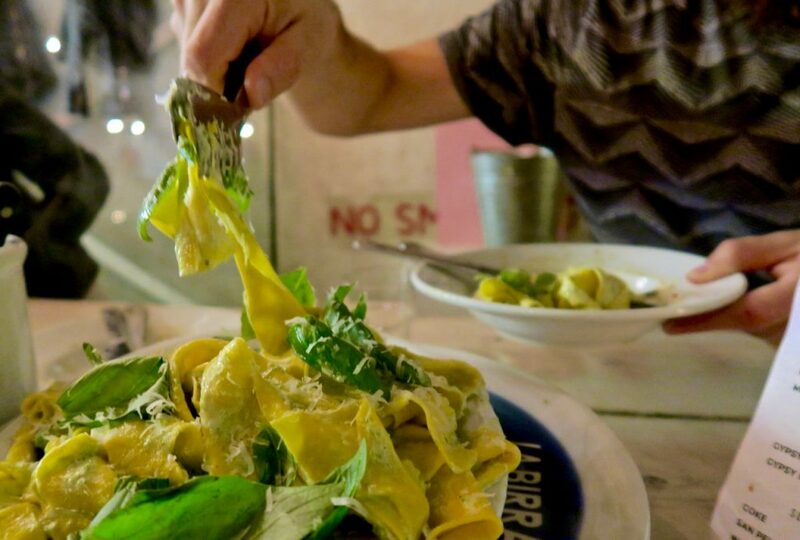 He explained to us that the menu changes seasonally but remains focussed on homely Italian fare and communal dining. 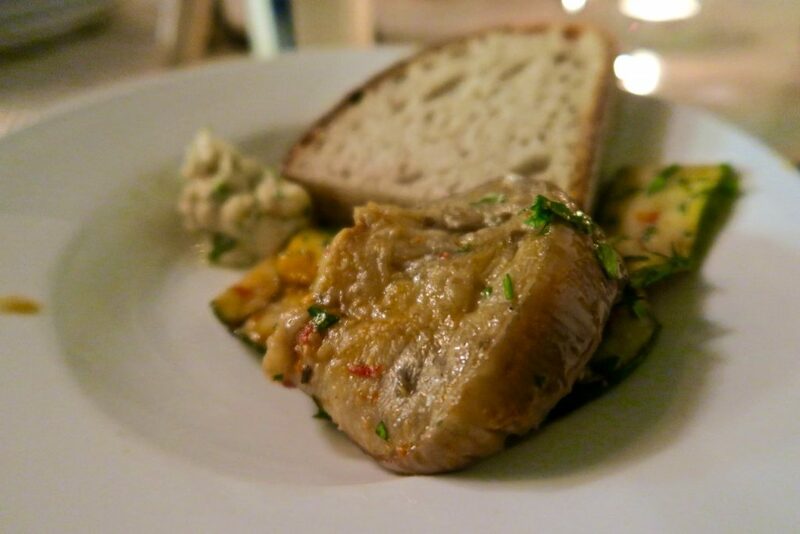 All of the food was grown and reared in the UK and sourced as close to London as possible to be kind to the planet whilst still serving up delicious dishes, at reasonable prices. An amazing whipped white beans dip, Peckham Rye sourdough, nocellara olives, roasted almonds with super fresh marinated vegetables. Everything was so amazing I had to stop myself from filling up on the first course. Pappardelle with wild Scottish mushrooms; I don’t usually get excited about pasta but this handmade dish was incredible rustic cooking at its best. 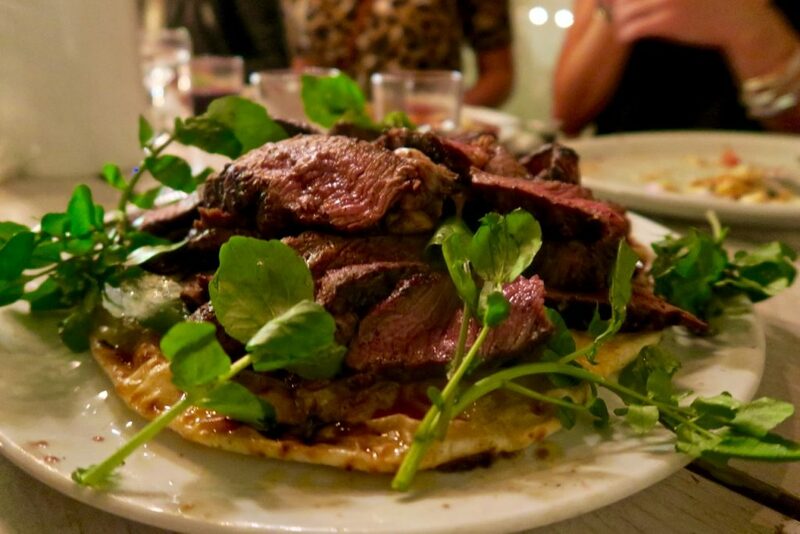 50 Day Aged Rump served on a flatbread which the juices oozed into served with with rocket & salsa verde. 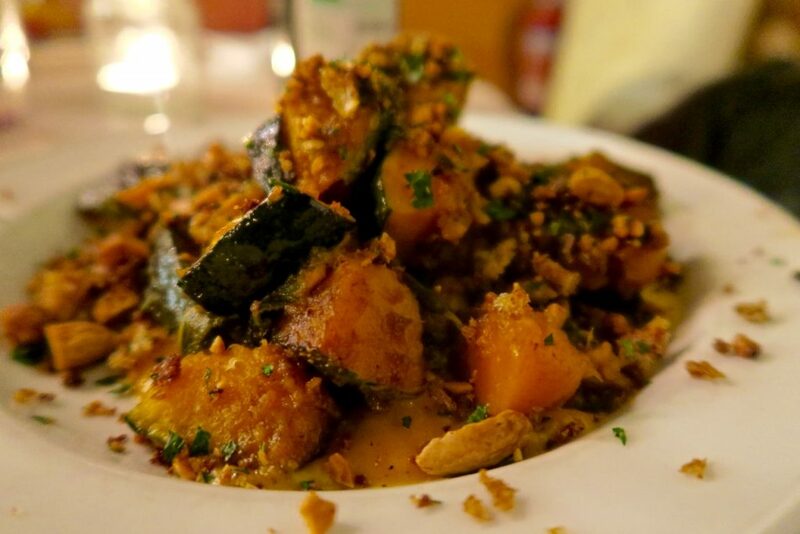 My vegetarian alternative was an equally appetising mashed delica pumpkin, pecarino and chestnut dish which also went down well most of the table who could not resist tucking in. 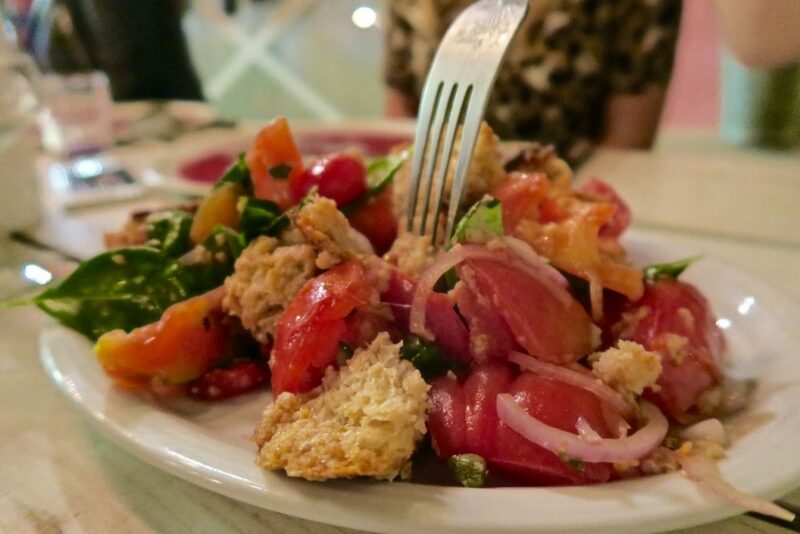 Panzanella & fire baked new potatoes; a simple but stunning dish made up of bread, super fresh tomatoes, onion and basil. 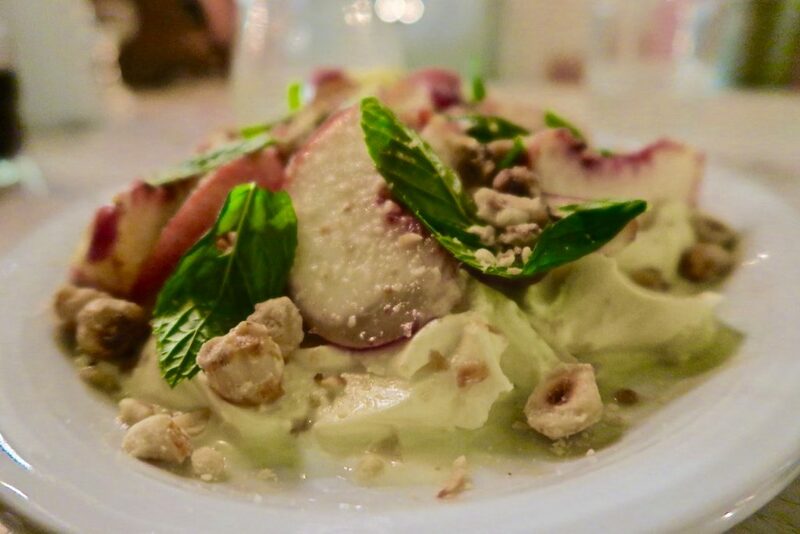 Poached red william pears with frangelico mascarpone, by this point I was so beyond full I only managed a small mouthful of desert but it was a light and refreshing end to our 5 courses. 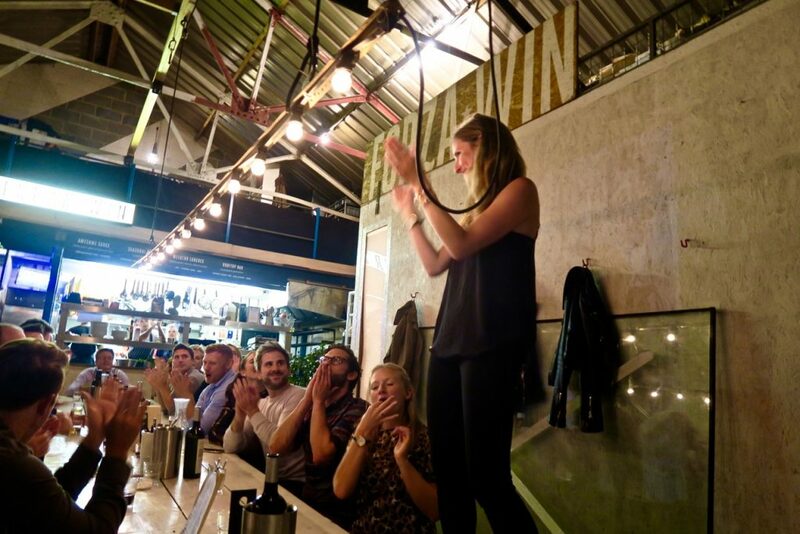 This kind of dining breaks down barriers between staff and other guests, and allows for a shared experience rather than just grabbing dinner. The set menu was £40 which for the amount and high standard of food was a complete bargain in my eyes. I understand that many Londoners are on a tight budget so if you want to sample what Forza Win has to offer at a lower price point they also put on ‘Awesome Sauce’ on a Wednesday which provides pasta and booze for £10, as well as various Italian delights at lunch time. 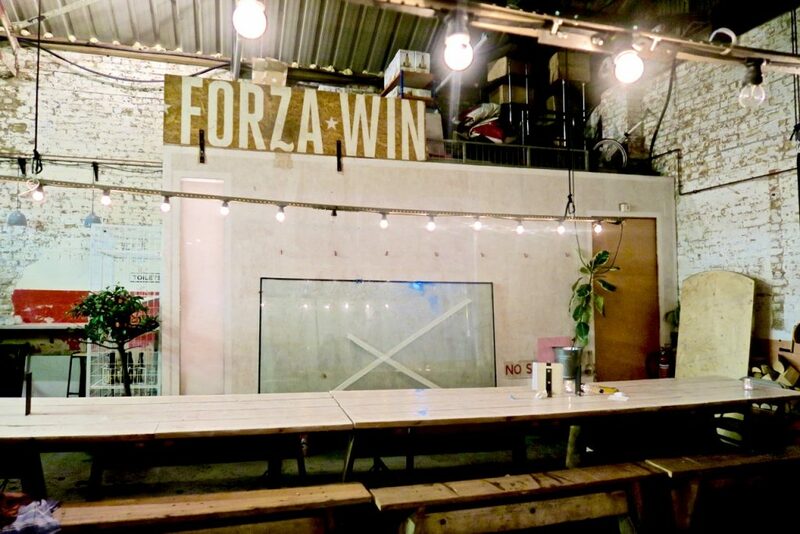 Forza Win is totally my sort of dining, casual, quality, innovative and ethical – I can’t wait to see what they come up with next season. Oooo another place to add to my list. I do love Italian food! You have got to go it’s SOOOO good! YOU MADE ME HUNGRY. I love the name of this place!